I wake up at 6:15 am. The bus to Mammoth leaves right now I whisper to HQ with a sleepy voice. Ya he says. And then we turn around and sleep till 7. I go down to the lobby of the Dow Villa hotel, get myself some coffee and get back in bed. O this feels like heaven. Sometimes the backcountry feels like heaven and sometimes a hotelbed does. We’re both relaxed, enjoy the breakfast in bed and do not worry one single second that we didn’t take the bus. We pack our stuff… slowly. Take a shower… slowly. I somehow have a feeling it’s a good thing we didn’t take the bus. I feel as if we are gonna meet people and we have something to share with them. In a way hitchhiking is letting other people allow you to step into their lives, just for a bit, but maybe still long enough to make a difference, to make someone smile or touch a heart. We step out of the Dow Villa. The sun is shining bright. We see clouds hanging over Whitney’s summit and think of our hikerfriends up there. We head over to the drug store, buy some stuff, have a chat with the lady behind the counter, get back out into the sun and put our thumb up. 1 minute later we’re in the car of a friendly lady who originally is from Japan and now lives in Independence. She drops us off at the gas station and there we go again. Thumbs up. 2 minutes later a camper van pulls over. The lady rolls the window down. Where do you wanna go? she asks in an accent that sounds very very familiar to me. Yosemite. But anywhere north from here is perfect! I say and I quickly add Where are you from? Both answer Belgium!!! OMG!!! So I start talking to them in Flemish, they open the back door, we step in, sit down and instantly connect. It is amazing. This is the ride I felt we would get. 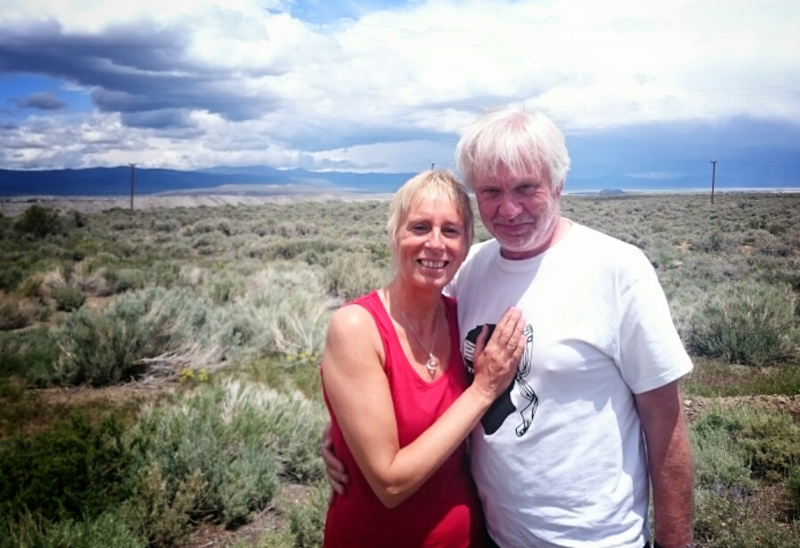 These wonderful people who only live like 35 miles away from my home in Belgium take us all the way to Lee Vining. We talk for hours about god and the world. I feel an immense feeling of gratitude coming over me. I’m moved. My heart is touched while I sit in the back of a camper van and drive north on the eastside of the Sierra. I am so glad Martine and Frank were sent to cross our path. When we hug and say goodbye I know we gave them something, something for the heart and the soul. I don’t know exactly what but I know it was important cause I can see a tear running down Martine’s face when we leave. Tears can be magic sometimes. They express emotion and so much more than that. Sometimes you meet people and you know it’s just no coincidence. We gave them something and they gave us something and maybe we will never meet again but we will never forget. That is what makes me happy. When I can touch someones heart, in a good way, in a way that makes a day brighter, that makes me happy, I know why I am alive. I can’t stop smiling when we head over to our next hitchspot along highway 120. This day has been amazing so far. A blessing. A true blessing. We put our thumbs up again. A few cars pass. And then a beige car stops. The electric window goes down. The lady asks us where we wanna go. Yosemite valley I say. Well I don’t go down to the valley but I go hiking in Tuolumne. That is perfect! 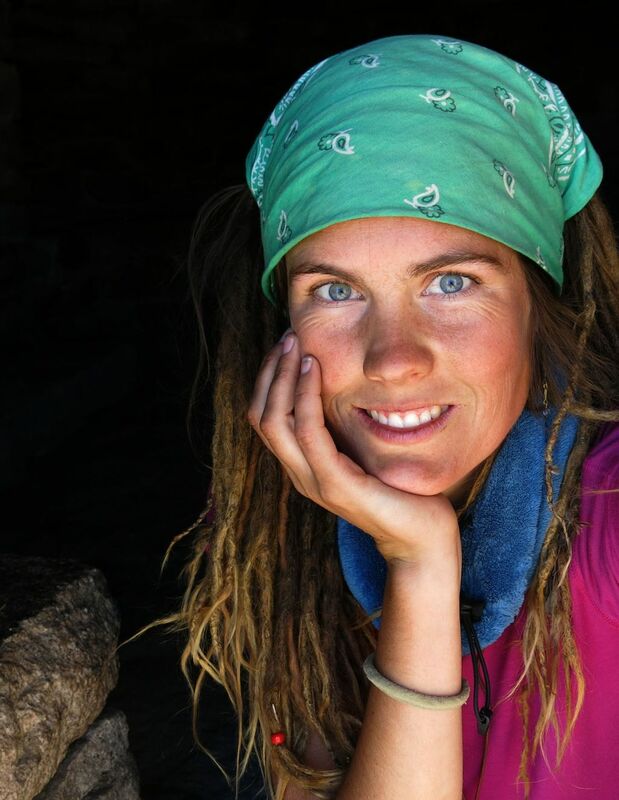 Can we drive with you till Tuolumne? Seconds later I sit next to an amazing lady who turns out to be 81!!! She goes out hiking on her own!!! Holy moly!!! We share stories and are inspired. We talk about mountain lions and she tells me one of her wishes is to see a mountain lion before she dies. I talk to her about my encounter and she too says O waw he wanted to be with you so you weren’t alone! I wish for her that she may see one from a safe distance, that she has time to admire his beauty, see the gracious movements. 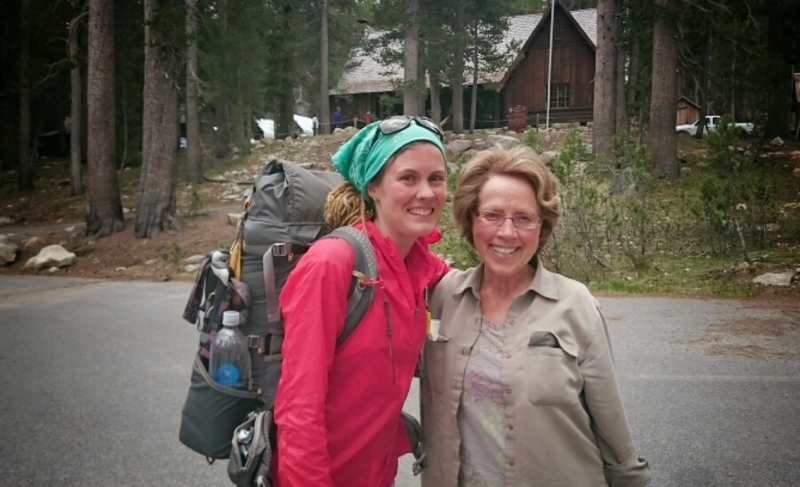 She drops us off at the visitor center in Tuolumne and then there she goes… Hiking… At the age of 81!!! For the forth time today we put our thumbs up. It takes about 10 minutes till a car pulls over. A married couple in their early fifties is driving to Mariposa grove to go see the giant trees. The valley? Is that on the way? It is it is! We hop in. They are from Arkansa, went to visit their daughter who studies in Cali, and are taking a few extra days off. We talk all the way down to the valley. And help them plan a 2 week trip through Europe. It’s great!!!! And then o yesssss thennnn THE VALLEY! Omg the Valley!!! My mouth drops open again, even though it’s not even 2 years ago since I been here. The valley just takes my breath away. El cap. 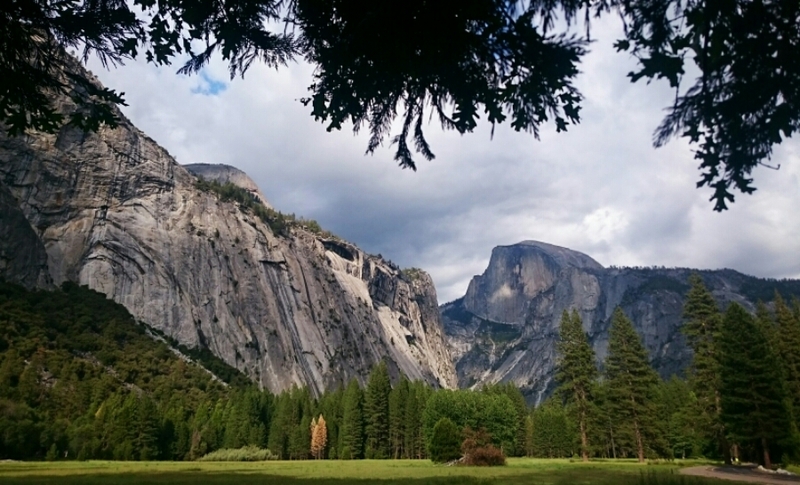 Half dome. Clouds and the occasional ray of sun that makes the granite glow. I feel so happy right now, so relaxed. Yes we made the right descision to come here and take some rest. We head over to the Wilderness center, get a permit, buy food, set up our tent in the backpackers campground and here I am. In the same place where I started my JMT-hike almost 2 years ago. The circle is round! The meeting of strangers is indeed such a gift. You are living the life the right way! Ya it’s wonderful getting to meet strangers who find a place in your heart! “Begegnungen, die die Seele berühren, hinterlassen Spuren, die nie ganz verwehen” dieses zitat fällt mir dazu ein. Ein Segen für euch und die menschen, die heute euren weg gekreuzt haben. Toll!